If there is one thing that I look forward to every Holiday Season, it has to be this Sweet Pepper Jelly. It’s a family tradition that has been around since before I can remember. My grandma would make several jars of it and we would always, always, always have it at Thanksgiving as a little appetizer. 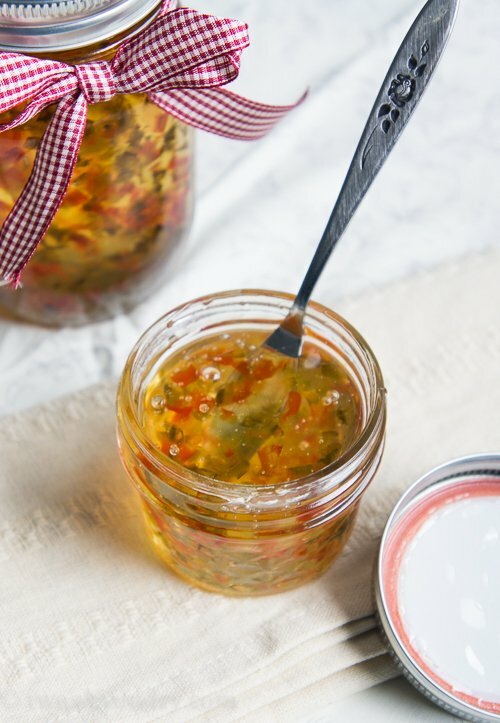 This Sweet Pepper Jelly makes an appearance at nearly every family gathering during the Holidays. The jelly is made with red and green bell peppers that are diced into a very small pieces then stirred into a slightly tart and sweet jelly. 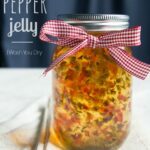 Since I am not going to be with my family this year to indulge in traditions, I decided to make my own batch of Sweet Pepper Jelly, and share the recipe with everyone. And more importantly… the proper way of serving it. 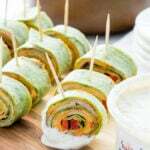 Place a brick of cream cheese on a plate or small serving platter. Pour Sweet Pepper Jelly on top. But seriously. This stuff is mega-addictive. You wont be able to stay away from it. Plus as an added bonus, it makes one heck of a homemade gift. It’s beautiful amber color with little flecks of red and green peppers make it a gorgeous seasonal gift that everyone will enjoy. Just wrap a pretty ribbon around it and you’re golden! I hope you enjoy this family tradition as much as we do. 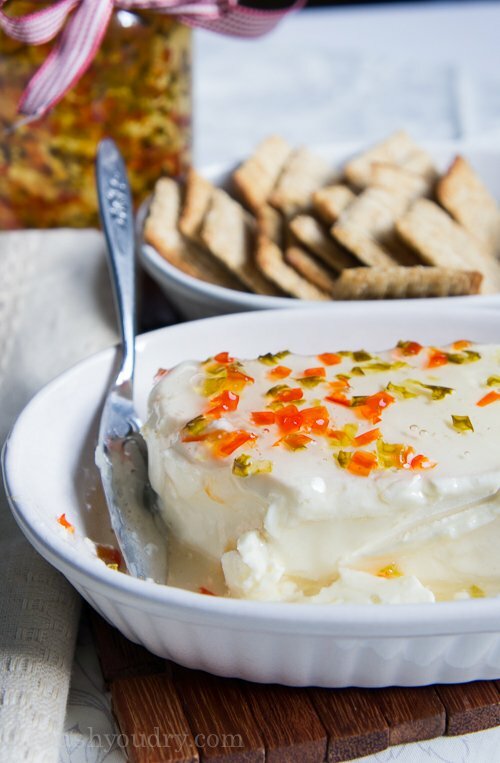 Serve this Sweet Pepper Jelly over a brick of cream cheese with crackers on the side. 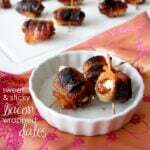 It makes a beautiful appetizer and gift for the Holiday Season! 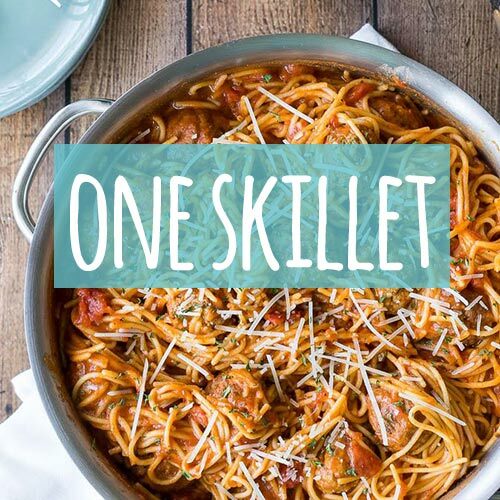 Combine the first 4 ingredients in a large stainless steel sauce pan (make sure to use one with high sides because it will rise and you don’t want it to boil over). Bring mixture to a boil, and boil for 6 minutes, stirring constantly. Add the pectin and continue boiling and stirring for an additional 3 minutes. Remove from heat and skim off (and discard) and foam on top with a spoon. Ladle the jelly into the prepared jars. Wipe off the rims and apply the lids. Place the jars in a large pot of water and bring to a boil for 5-10 minutes. Carefully remove from water and let cool. Jars can be stored at room temperature. Once opened, store in refrigerator. I thought it was a ornament because this jelly jar is very pretty. Thank you for sharing the recipe! I have never try this sweet pepper jelly, gonna make it soon. 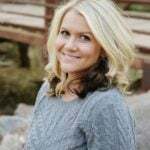 can I use powdered pectin instead of liquid? I’m not sure what you’re asking here. Can you rephrase? In the final stage, do you tighten the lids on the jars before boiling them for 5-10 minutes? If so, do they have to be a certain type of jar? Or do you leave the lids a little loose and tighten after boiling? (I was worried about pressure building in a sealed jar). We always waited till the jars popped to assure they were sealed then turned them upside down to finish cooling, this usually ensured even distribution of the peppers, but you may have to flip it again before it finishes cooling if the peppers appear to all be going to the other end now. 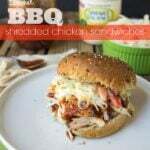 Thanks for the idea of over cream cheese, missed that, we have always just used it on meat. But recently I have used it mixed with stir fried chicken and veggies and served over rice. Could you add a spicy pepper in to this without it messing up the recipe? Just to kick it up a little. 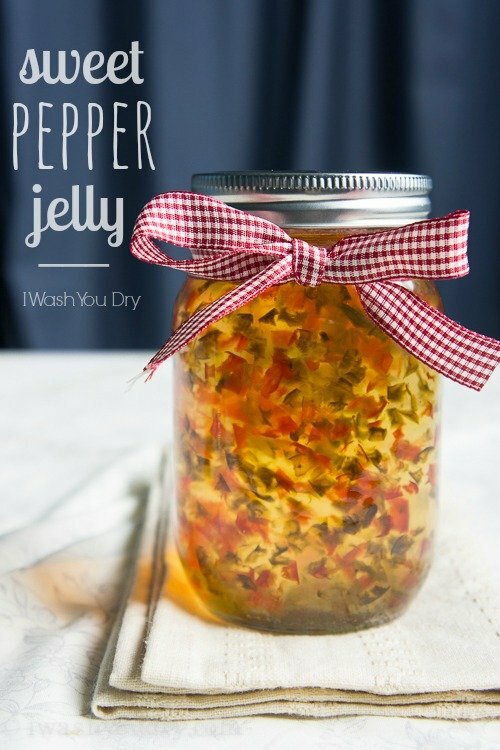 Either way I’ll be making this for my mother, she loves pepper jelly! Thanks for sharing! I’m sure you could throw in a small diced jalapeño, but I’m not sure how the flavor would be. If you try it, please let me know! Why did all of the peppers stay at the top of the jar. I’ve never canned before. What did I do wrong? Do you have to can this?? Or can you just put it in jars?? 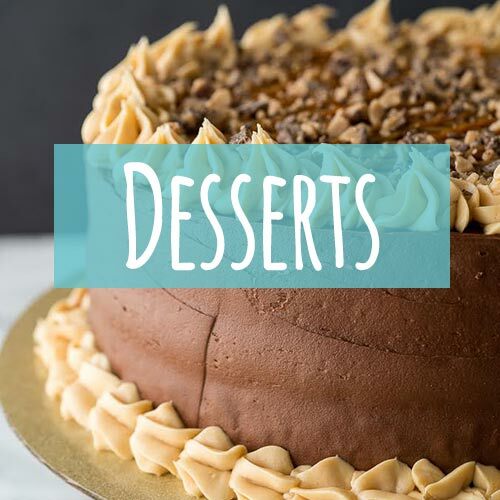 I just came across this recipe after drooling over your Nanaimo Cheesecake recipe…mmmm….definitely pinned it! And this one as well. I love sweet pepper jelly, but have never made it (and can’t find the one I like at the store anymore). 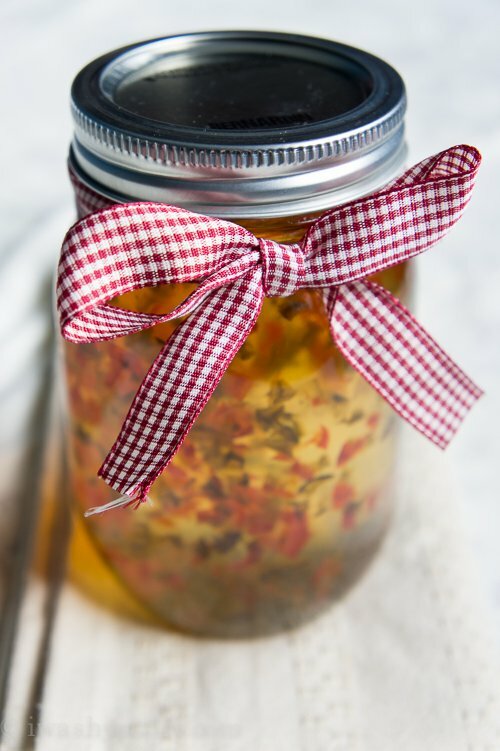 While I use jars all.the.time, I’ve never officially ‘canned’ anything (always seemed a little intimidating) – but your recipe looks so easy that I think I am finally going to try it! Not only will I get to can for the first time, I will also get to enjoy and share a delicious holiday gift with some of my family that also loves sweet pepper jelly! Ohh I love pepper jelly! My coworker makes it and serves it with cream cheese. Can’t wait to give this a try. I have to admit I was very excited to see this recipe. I love pepper jelly. It’s time I make my own. 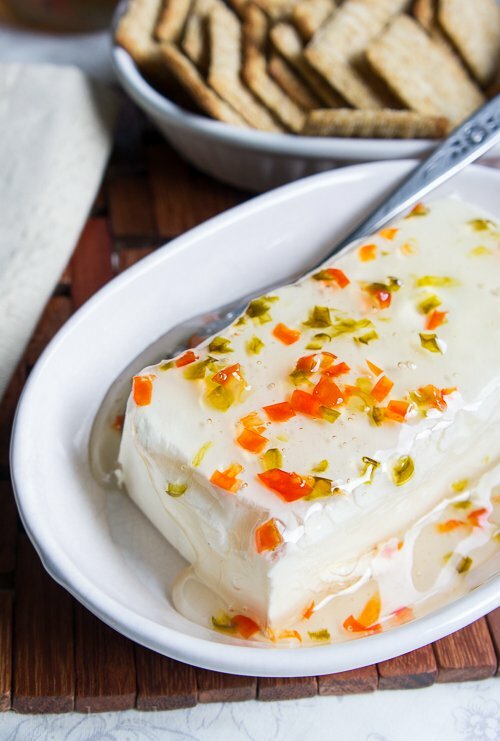 Pepper jelly on top of cream cheese is my most favorite appetizer! I always keep pepper jelly! I love it with roast beef and on turkey sandwiches. Please try it with meat if you haven’t. It’s delicious. I love this jelly and have been looking for the recipe! Thank you for posting! So pretty!! What a fun holiday gift. This looks really good!!!! We have tried several different pepper jellies like this and have been pleased with them! However, my family prefers it mixed in to the cream cheese rather than poured over the block. The amounts are the same, you just soften the cream cheese and mix the jelly into it. Oh my goodness…I haven’t had that jelly in so many years. I remember eating that on cream cheese at my grandpa’s house years ago! What a fun flashback!! !